There are two basic schools of thought in the wellness industry. The ones who look forward (think body-hackers, biometricians and Silicon Valley) and the ones who look back (think yogis, paleo dieters and that guy in your Facebook feed who just quit his 9-to-5 to become a sound healer). Somewhere in the middle are the pragmatists, who embrace technology but also know that naturally derived products and old-school methods are often more effective than their modern counterparts. This is your guide to joining their camp: The Gentleman’s Handbook, Vol. XV: You’re a Natural, made in partnership with Cotton. 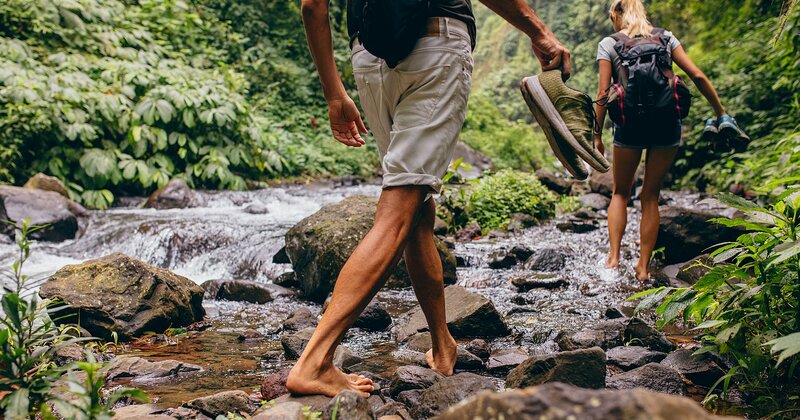 Below, you’ll find indispensable advice on getting back to the basics, from the comfortable, stylish gear you should be wearing to the ultimate equipment-free workout to some zen destinations where you can properly unplug and recharge amid Mother Nature’s splendor. Don’t think of it as an overhaul. It’s more of an underhaul. But your mind and body will be better for it, trust. Just when you thought technology couldn’t possibly insert itself into another aspect of your life … you went to buy a new shirt. And found that today’s menswear market, from business attire to workout gear, is bursting at the seams (har) with all manner of space-age fabrics, 3D body scans and other various and sundry “______ of the future” promises. In truth, your clothes quite simply don’t need hacking — ol’ Ma Nature did a pretty good job from the get-go. Not only is cotton a natural fiber (a little Googling turns up origins like oil and coal for synthetic fabrics), but it boasts all the hallmarks a guy looking to live his most comfy and confident life could look for: Breathable? Bet your summer commute on it. Durable? There’s a reason you’ve owned your favorite jeans since Seinfeld debuted. Technical? Look no further than your non-iron cotton dress shirt that wicks moisture with the best of them. And as for versatility … well, why not let our handy shopping guide below be your answer there, with our favorite picks for any situation life throws your way. In the age of upscale gyms and boutique classes, the focus is more on newfangled equipment than your actual physical fitness. To bring exercise back to its roots, we recruited Luke Zocchi, longtime personal trainer for Chris Hemsworth and creator of both the Twenty40 program and Sipp Instant coffee and tea, to offer up a full-body, body-weight workout you can complete anywhere … and that requires exactly zero thousand-dollar, neon-lit machines. The workout takes just 20 minutes total. Each exercise = around one minute of work. 1. Squats: Back straight, knees in-line with toes, lower while engaging the core. 2. Lunges: Shoulders above hips, lunge forward with front knee directly above the ankle. Drive back up with weight in the heel. 3. Burpees: Place hands on the floor, jump feet back, do a push-up, jump feet forward, then jump straight up. 4. Bear crawls: Pushup position, knees at 90 degrees and under your hips. Crawl forward with your core engaged, alternating hands and feet. Can be done in place. 5. Kick sits: Squatting down with hands planted on the ground in front, rotate 90 degrees to the left, kicking out the right leg, then rotate 180 degrees to the right, kicking out the left leg, then 180 degrees back to your original position. Repeat the full circuit four times, et voila, you’re done. And probably painfully gassed. Good for you. Choose the bulk of your diet from foods that are still in their natural form, such as vegetables, fruits, salads, lean meat and fish. Cut out as much processed food as possible. Cut out as much sugar as possible. Cook more meals at home, as you can control the nutritional value better. Say “I can’t cook.” If you can’t cook, it’s time to learn. Eat so fast. Slow down, enjoy your food and after 20 minutes, your mind will tell you you’re full. Let restaurants decide how much dressing to put on. If you order salad, get it on the side. Judge your diet against others. Everyone is different, so take note of what works for you and how you feel. Feel guilty about eating comfort food — just make sure you earn it. We mind what we eat and wear when we want to look (and feel) good. But we often overlook the part that comes before getting dressed: our hygiene. It pays dividends to avoid unpronounceable, unnatural ingredient lists when it comes to grooming routines, because even a tidy toiletry shelf can be an insidious entry point for unwholesome additives. Gentle reminder that not all home optimization requires an app or wifi. You can also bring peace and efficiency to your home by making it more zen (and less tech-obsessed) space by space. 1. Replace your personal and guest linens with fine cotton ones, including towels. It’s a detail that pulls its weight when it comes to feeling comfortable and rested, post-bathing and sleeping, and research shows that the breathability of cotton beats out synthetics when it comes to getting a good night’s sleep. 2. Clean the air and introduce life to the room with low-maintenance plants. You don’t need to have a green thumb to access the benefits of a Pothos plant, which purifies the air, or Aloe, which grows plump with skin-saving gel: crack open a leaf and apply on the spot to problem patches or sunburns. 3. Upgrade your cookware with a professional-grade ceramic non-stick pan set that’s NOT made with toxic chemicals, lead or cadmium, for safe and healthy at-home cooking. Don’t spoil your efforts towards healthy eating with aging or obsolete cooking materials. 4. Swap a couple plastic patio chairs for more lounge-friendly cotton hammocks that encourage relaxation. No one has ever had a bad time in a hammock. 5. Optimize lighting throughout your home to set the desired mood. Experiment with the benefits of different colored lights, or make over your patio setup with app-connected, dimmable outdoor numbers. An all too familiar situation: you plan the entire getaway, from the packing to the transport to the accommodations, and arrive only to find yourself checking email and scrolling through Instagram rather than enjoying the relaxing fruits of your labor. A shame, but a preventable one: options now abound for trips that are delightfully analog (see: wood-burning stoves, lack of cell reception), but still flush with creature comforts (see: comfy beds, world-class chefs). Below, you’ll find jaw-dropping locations scattered across the country that require nary but a good book, whiskey flask, s’mores skills and a tentmate. The Digs: We’re partial to the “Stargazer” tent featuring a domed viewing window above the king-size bed for … well, it has the name for a reason. The Digs: A variety of options, all including private bathrooms, turn-down service and complimentary playing cards, among other top-shelf touches. The Digs: A collection of charmingly diminutive cabins tucked away in the woods, featuring cozy, woody interiors, full kitchens stocked with grub and big bay windows for enjoying the view.